Get your Copy of The Happy Prophet Now!!! Click below to join the "All Things Prophetic" Facebook group for regular doses of encouragement, prophetic insights, and heavenly encounters. We also discuss topics you are interested in including dreams, visions, encounters, angels, words of knowledge, prophecy, and much more. Simply go to the link here to be connected to my private Facebook group where you will join a group of prophetic people hungry for more of God. Click button below. Be equipped and empowered as an emerging prophet. Sign up today and start your prophetic journey! Click the sign up today button to go to the Master Class Sign Up. Book your Breakthrough Session Now!!! Click the button to find out more about a one on one consultation with Keith Ferrante. 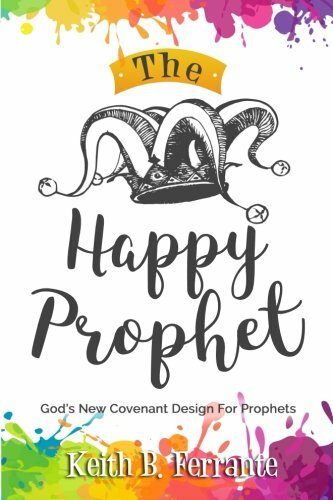 The Happy Prophet is an exciting reminder of God’s joyful design for New Covenant prophets. Keith removes performance-based mindsets as he points to the incredible view offered from the right side of the Cross where we, who have been co-seated in heavenly places, can remain filled with a trusting faith that comes from our loving Father. The pages in this book are filled with wisdom and insights that will help you live a prophetic lifestyle in an honest, authentic way, and to sustain your joy in every circumstance. You will be encouraged and inspired. Let the Happy Prophets arise!